This all-American classic is the ultimate steak sandwich. Although traditionally made with provolone cheese, I use oak-smoked cheddar, which is just as good. 1. Toss the steak with the paprika and 1⁄2 tbsp oil; season. Heat the remaining 1⁄2 tbsp oil in a large frying pan over a high heat, add the steak and fry for 2-3 minutes on each side, until cooked to your liking. Transfer to a plate and leave to rest under foil. 2. Add the onion and pepper to the pan and sauté overa high heat for 2-3 minutes, stirring, until softened. Add the sliced mushroom, season and cook for 3-4 minutes, until wilted, then toss in the cheeses and jalapenos. Once the cheese has melted, set aside and keep warm. 3. Slather the baguette with the mustard. 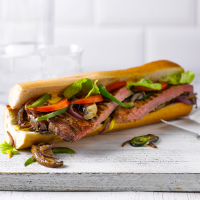 Halve or thinly slice the steak and pile into the baguette with the cheesy onion mixture. Top with the tomato, lettuce, and more mustard, if liked. Cut in half and serve.